The purpose of this paper is to argue for more histories of Australian legal scholars that study their endeavours through the lens of legal education; in other words, studies which situate legal scholars within the context of Australian law schools. 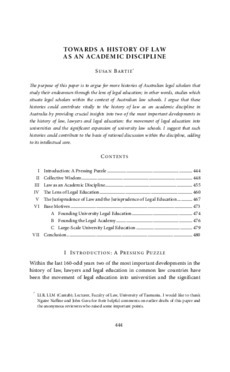 I argue that these histories could contribute vitally to the history of law as an academic discipline in Australia by providing crucial insights into two of the most important developments in the history of law, lawyers and legal education: the movement of legal education into universities and the significant expansion of university law schools. I suggest that such histories could contribute to the basis of rational discussion within the discipline, adding to its intellectual core.